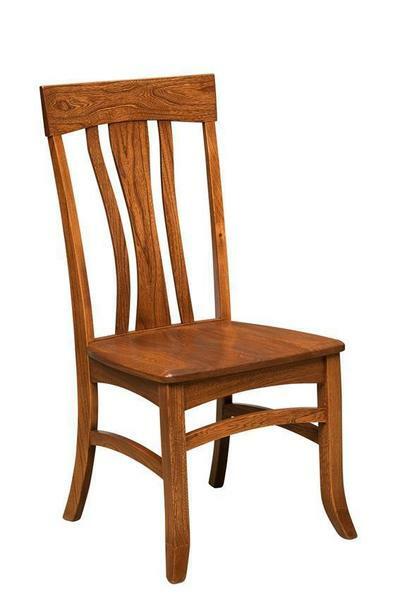 Our Amish Rainier Dining Chair is handcrafted right here in America and will be a perfect fit for your dining room. Mortise & tenon construction will ensure you are able to enjoy this piece in your home for many years. Look forward to relaxing in the high quality that Amish furniture possesses. Small details turn out to be a big deal with this piece. Subtle hourglass curves are featured in its comfortable back splat and will have you feeling at ease throughout any occasion. Every inch of this chair is hand-sanded twice which guarantees the smoothest finish for your home. The stain of your choice will be hand-rubbed in order to provide the best color. Should you have any questions about this or any of our American-made products, please do not hesitate to give us a call! 866-272-6773.